We might not be back here for a while. And I don't mean the redzone. 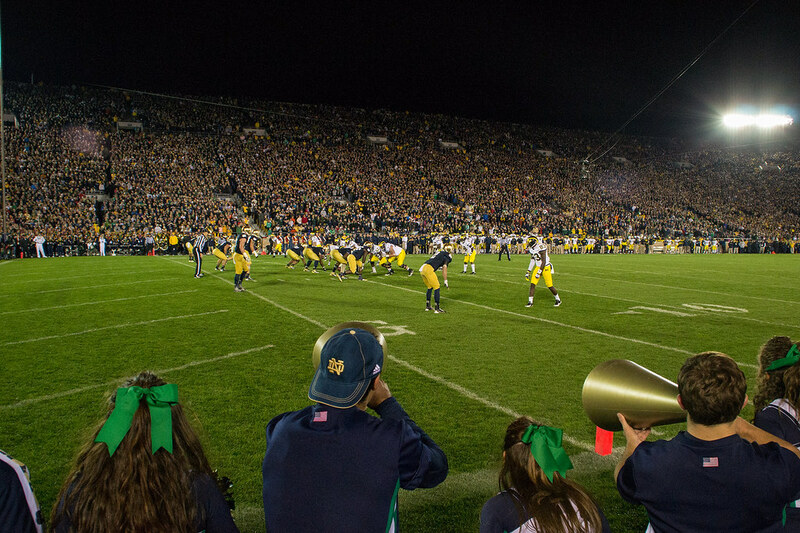 Much has been made of Notre Dame's decision to back out of the Michigan series in 2015. The series was set to take a hiatus in 2018-19 anyway, and even with Notre Dame's most recent decision, there's no certainty that they might or might not make their way back onto the schedule in 2020. This series is good for the game. As the two of the most storied programs in college football, it's still meaningful when Michigan and Notre Dame play each other. It's always one of the bigger early-season games every year. And the recent trend of playing at night, it's only increased the anticipation and excitement of the matchup. I've been very much in favor of keeping the series alive. I have no problem playing Notre Dame every year. But it would seem to me as if we might be at the end of this storied rivalry for a while. The way in which Notre Dame's athletic director, Jack Swarbrick informed Dave Brandon of the decision raises a concern with me. Brandon wasn't asked to be a part of the decision process, he wasn't even given a head's up. He was handed a letter about an hour before kickoff Saturday night, which he didn't even read until the next morning, which informed him that after 2014, Michigan will be off the Irish schedule. This decision surprised me. Notre Dame cherishes their independence, much to the chagrin of Big Ten fans who might secretly or publicly want them to join the conference. The Michigan series is at the heart of Notre Dame's conference independence. By brooming us off their schedule, that independence will take a hit. And pseudo-joining the ACC and thumbing their nose at Michigan in the process, won't help either. I suspect that while Dave Brandon is the AD at Michigan, Notre Dame will remain off the schedule. So much so that the matchup next year very well might be the last time we play the Irish for a while. I don't think Brandon has any interest in returning to South Bend in 2014 to wrap up the series where it resumed in 2002. Just my gut feeling. So that brings us to the obvious question of who does Michigan get to replace Notre Dame? Personally, I have my list of favorites. But the reality of scheduling a big name opponent with such short notice is an issue. Most big schools like Texas, LSU, Oklahoma, USC, Florida State already have their schedules set for the next few years. And I don't think a big-time school would back out of an existing agreement to schedule and home and home with Michigan. MGoBlog dig some a lot of digging and created a nice list of possible replacement schools based on schedule availability. Among the schools on that list that seem plausible: Oregon, Arkansas, Alabama, Auburn, Oklahoma State, Georgia, Washington – all seem like good choices. Personally, I'm more in favor of Oregon and/or Georgia. Either works for multiple reasons, mainly gaining national recruiting exposure. Eventually, I don't think Notre Dame will be missed by most Michigan fans. It's a shame to see it end, but it's not like Michigan doesn't have better conference rivalries already in-place. I think the most interesting thing will be to watch is Notre Dame's slow but eventual march towards conference affiliation. It seems inevitable.